I’ve been mad about Pocket Casts for ages, because while it’s been a reliable podcast player for Android and iOS over the years, it hadn’t been updated to include some basic features that others had – despite being a paid product. It’s now been overhauled with a glorious redesign, and I’m happy to report that it’s back in my good graces as a result. For starters, it’s solved my biggest gripe with the app. You can now tap on podcast cover art across various screens in the interface to learn more about the show. That’s handy for when you’re subscribed to some 300 podcasts and can’t remember what each of them are about. The update also brings a couple more key features: you can now play podcasts without first subscribing to them (great for checking out recommended shows quickly), and you can also search for individual episodes by using words from the show notes in your queries. Plus, version 7 syncs your personally curated Up Next playlist with your account, so you can hear your shows in the sequence you set up on your phone across other devices. That’s in addition to a revamp of the interface that’s in line with Google’s new Material Design guidelines. The app looks a lot nicer as a result, and it’s a joy to navigate around. Functions and info are much easier to access from various screens, and you can now switch between three themes (light, dark, and an AMOLED-friendly dark theme). 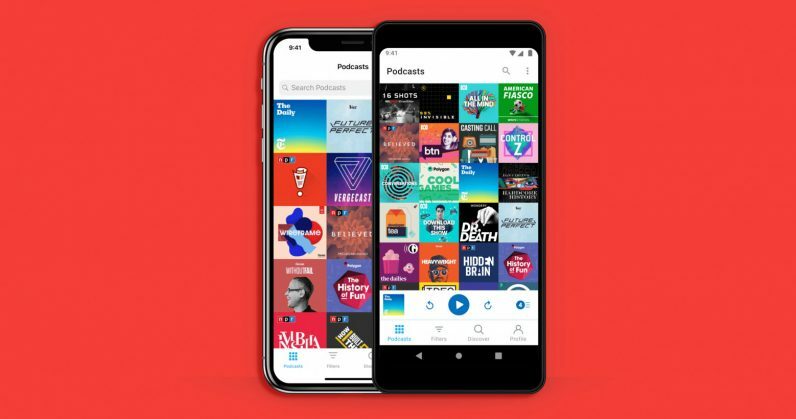 I’m definitely biased because I’ve paid for and used Pocket Casts extensively over the years, but I’ve been tempted by the likes of Google’s no-frills Podcasts app, and Marco Arment’s Overcast for iOS. The latter is well thought out, works great, and was recently redesigned. Pocket Casts’ Android app isn’t yet perfect: it’s still in beta and doesn’t yet have the new Listening History feature, certain interactions are inconsistent (like when podcast art brings up info), and the episode download button has been annoying replaced with a play button. That said, it offers a great experience that’s sure to delight long-time fans of the app, and attract new users as well. This is the first major update the app has received since it was acquired by NPR back in May. I expect that it’ll next get more features to enhance podcast discovery. You can try the app in all its updated glory on Android (in beta) and iOS for $3.99, web (for a one-time fee of $10.62), macOS, and Windows 10 (though I had trouble installing the PC version). If you’re looking for podcasts, we’ve got some recommendations to get you started. And if you want to pester encourage your friends to get into podcasts, here’s a handy tool for curating a custom playlist of your favorite episodes.